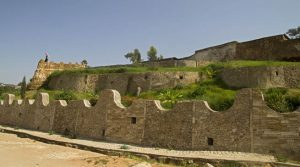 The fortified historic town of Harar is located in the eastern part of Ethiopia, 525 km from the capital of Addis Ababa, on a plateau with deep gorges surrounded by deserts and savannah. The walls surrounding this sacred city, considered “the fourth holy city” of Islam, were built between the 13th and 16th centuries and served as a protective barrier. Harar, With 368 alleys squeezed into just one sq km, the old walled city of Harar in eastern Ethiopia is a colorful maze that begs exploration. It was once a prosperous, independent kingdom, lives a strangely insular existence. 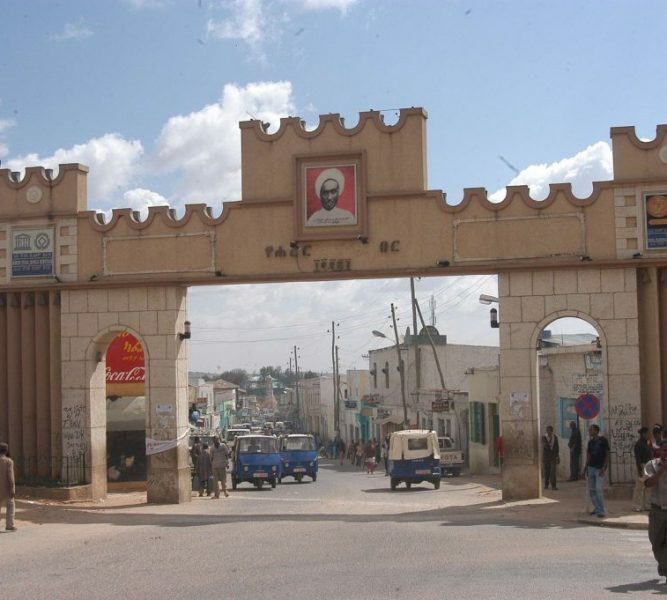 There were five historic gates, which corresponded to the main roads to the town and also served to divide the city into five neighborhoods, but this division is not functional anymore. 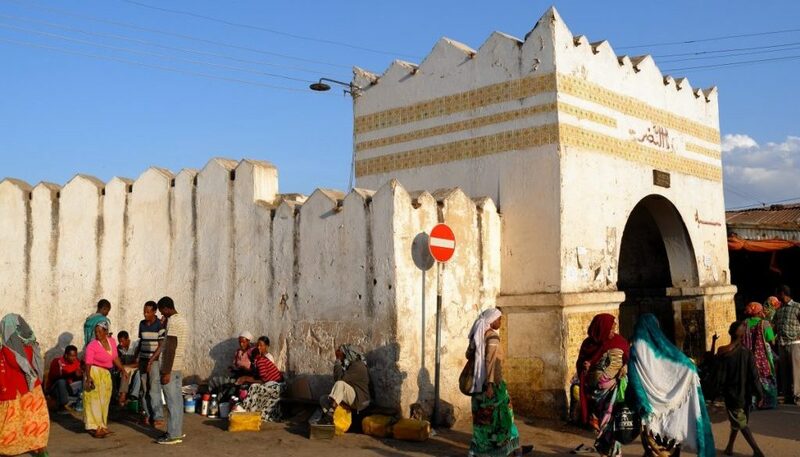 The Harar gate, from where the main streets lead to the center, is of recent construction. Harar Jugol numbers 82 mosques, three of which date from the 10th century, 102 shrines and a number of traditional, Indian and combined townhouses with unique interior designs, which constitute a spectacular part of Harar’s cultural heritage. Harar is often referred to as the fourth holiest city in Islam and known in Arabic as Madeenat-ul-Awliya (the City of Saints). 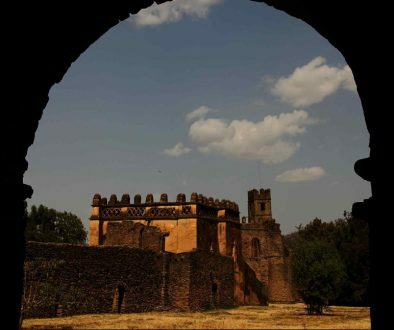 Its thick, five-meter-high walls were erected in the 16th century as a defensive response to the neighboring Christian Ethiopian Empire, but today Muslims and Christians share the city in peace. 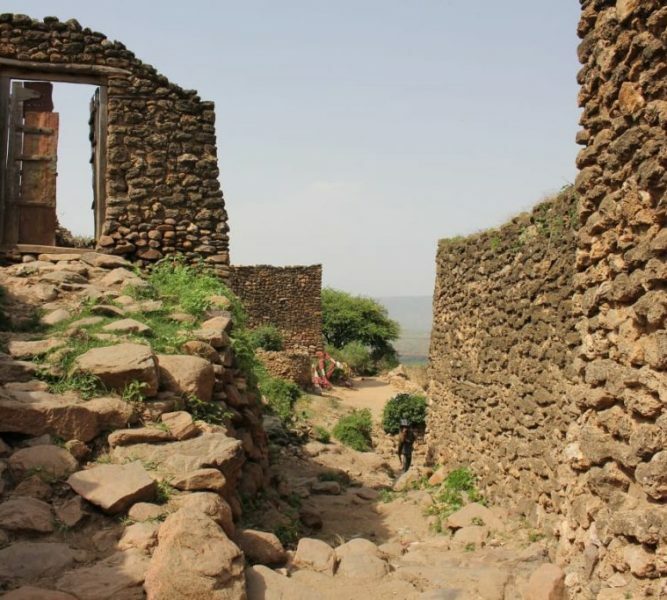 Harar grew into a crossroads for commerce between Africa, India, and the Middle East and was a gateway for the spread of Islam into the Horn of Africa. 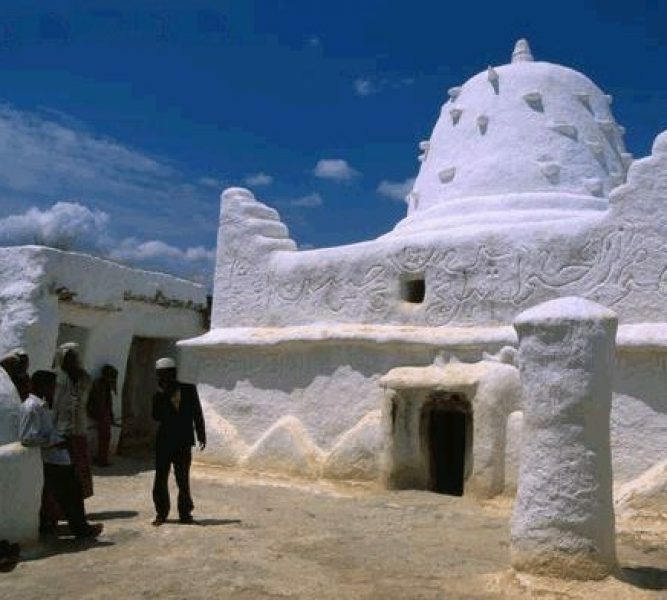 The African and Islamic traditions influenced over a long period of time the development of the city and its typical urban planning and contributed to its particular character and uniqueness. The present urban layout follows the 16th-century design for an Islamic town with its central core occupied with commercial and religious buildings and a maze of narrow alleyways with imposing facades. The traditional Harari house has a typical, specific and original architectural form, different from the domestic layout usually known in Muslim countries, although reminiscent of the coastal Arab architecture, and with an exceptional interior design. At the end of the 19th century, Indian merchants built new houses with wooden verandas that defined a different urban landscape and influenced the construction of the combined Indian/Harari houses. Their architectural and ornamental qualities are now part of the Harari cultural heritage. 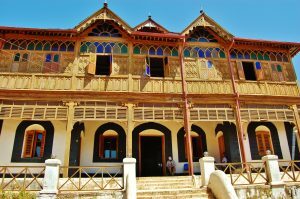 Harar functioned as the capital of the Harari Kingdom from 1520 to 1568, became an independent emirate in the 17th century and was integrated into Ethiopia in 1887. 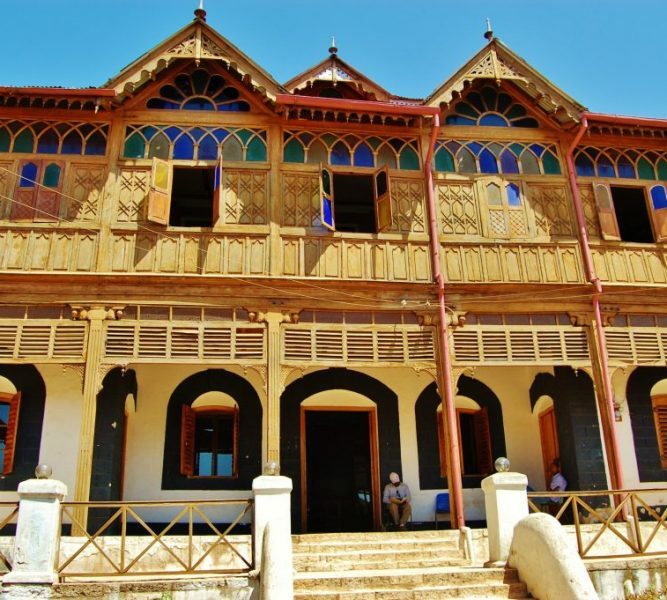 From the late 16th century to the 19th century Harar was an important trade center between the coast and the interior highlands and a location for Islamic learning. 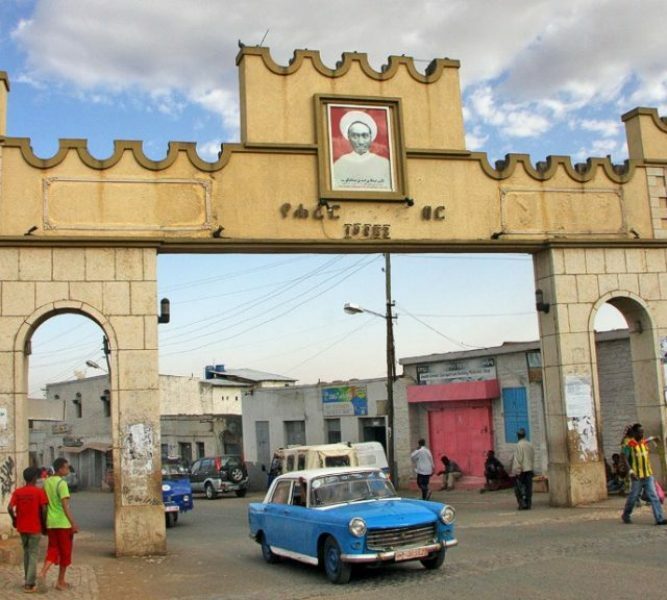 Today Harar is the administrative capital of the Harari People National Regional State (HPNRS). The historic town has a traditionally functioning community, forming a complex social-environmental whole where each element has its symbolic and practical significance. The Harari people are distinguished by the continued cultural traditions and quality of their handicrafts, including weaving, basket making, and bookbinding. The organization of the communities through traditional systems has preserved its social and physical inheritance and, significantly, the Harari language. Before the holy month of Ramadan, locals repaint the walls of the old town in vibrant colors. As the sun sets, the streets of Africa’s Mecca come to life as locals break they are fast, meet neighbors to chew khat and practice the rhythmic Zikri ritual among the Sufi shrines. 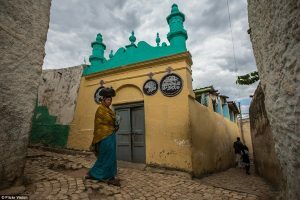 Few places are as contradictory as the eastern town of Harar, a Muslim city with a Catholic church dominating the main square in an Orthodox Christian country. 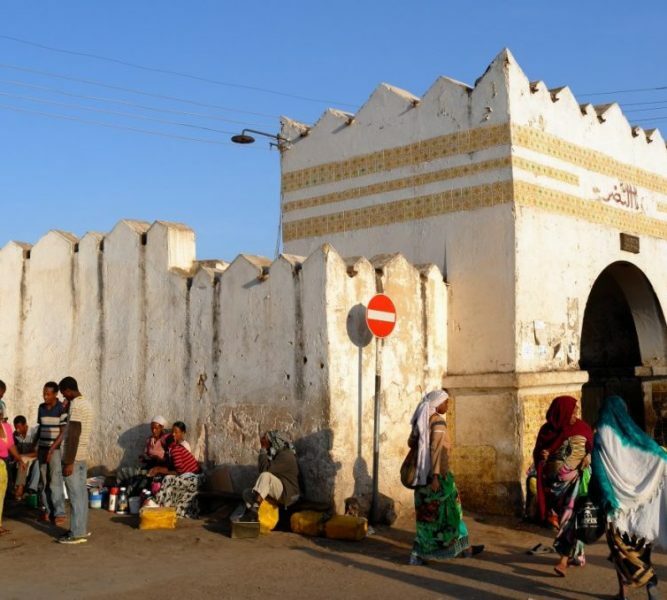 “Even the hyenas are accepted here,” It’s believed that Harar adopted Islam in the 7th century, at the same time as the Prophet Muhammad spread his teachings, and so Harar is considered by some to be Islam’s fourth holiest city, after Mecca, Medina, and Jerusalem. The town’s representatives claim it was the first society to accept the prophet, Muhammad. 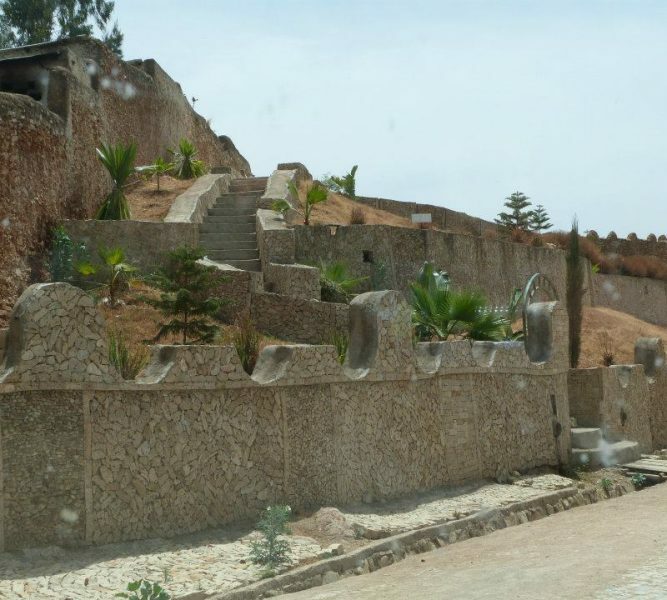 Harar is also a UNESCO World Heritage Site. The “City of Saints” has other, more sinful, claim to fame. Harar coffee is said to be the country’s finest, its beer the most popular, its khat (a natural amphetamine-like stimulant) the strongest, and its hyenas the friendliest. producer of arguably the world’s best coffee, Harar’s local factory is said to produce the highest quality. In the book Coffee: A Dark History, industry veteran Antony Wild calls Harar “the cradle of coffee itself” and notes that “until the mid-sixteenth century, the [world] demand for coffee was met by Ethiopia entirely.” But coffee pales in popularity to khat, a bitter leaf that gives its chewer a mild buzz. Citizens of all ages dig into bags of the plant throughout the day to add to the wad in their cheek. But the khat is not just for domestic consumption. Outside Harar is one of the world’s largest khat markets, which shuttles tens of thousands of dollars of the stimulant to Somalia and Djibouti nightly. 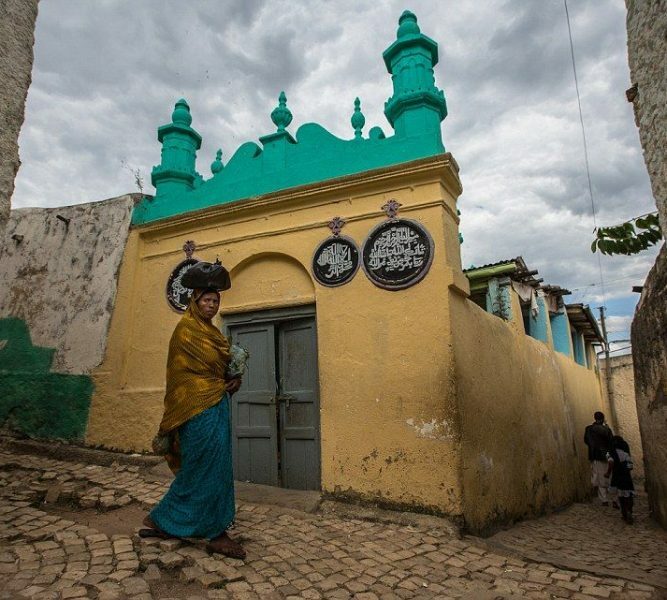 The historic town of Harar Jugol exhibits an important interchange of values of original Islamic culture, expressed in the social and cultural development of the city enclosed within the otherwise Christian region. 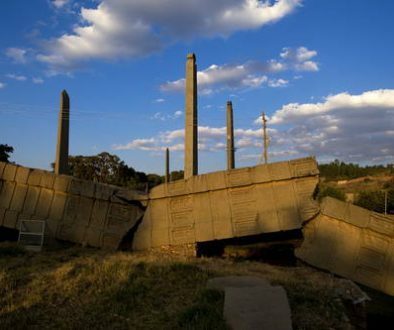 Such influences have been merged with traditions that relate to the inland of Africa and particularly to southern Ethiopia, giving a particular characteristic form to its architecture and urban plan. 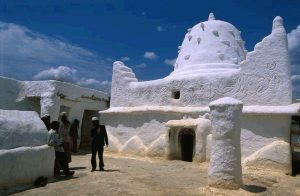 Harar Jugol is an outstanding example of a type of architectural and urban ensemble which illustrates the impact of African and Islamic traditions on the development of specific building types. 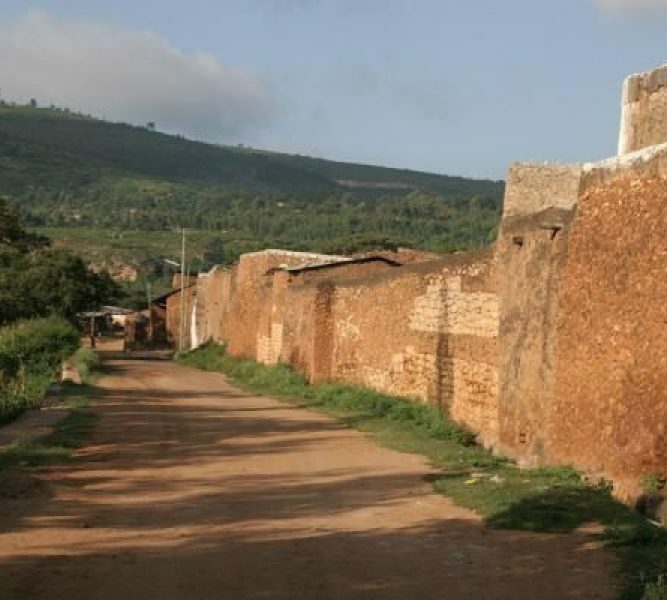 The building types and the entire urban layout reflect these traditions, which give a particular character and even uniqueness to Harar Jugol. 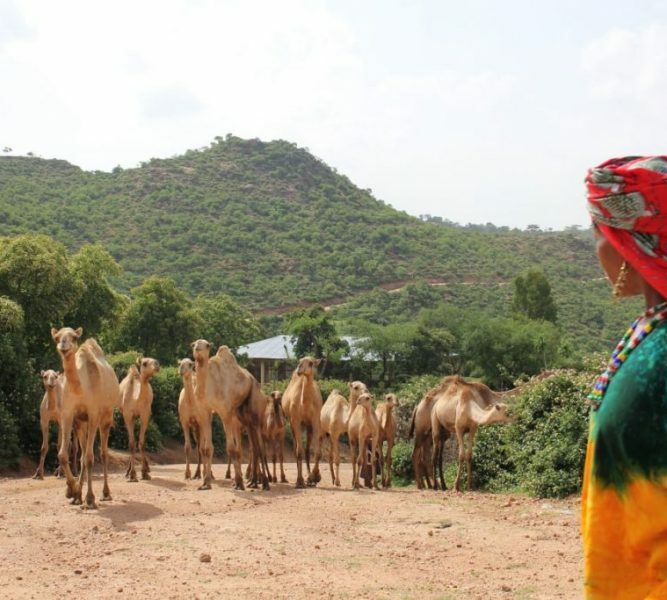 Harar Jugol with its surrounding landscape is an outstanding example of a traditional human settlement, representative of cultural interaction with the environment. 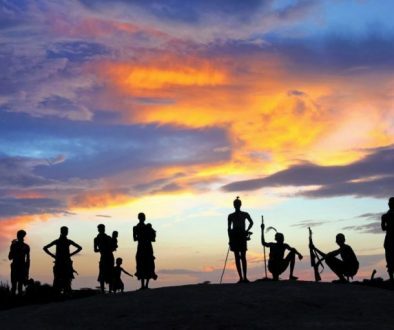 The social and spatial structure (afocha) and the language of the people all reflect a particular and even unique relationship that there developed with the environment. 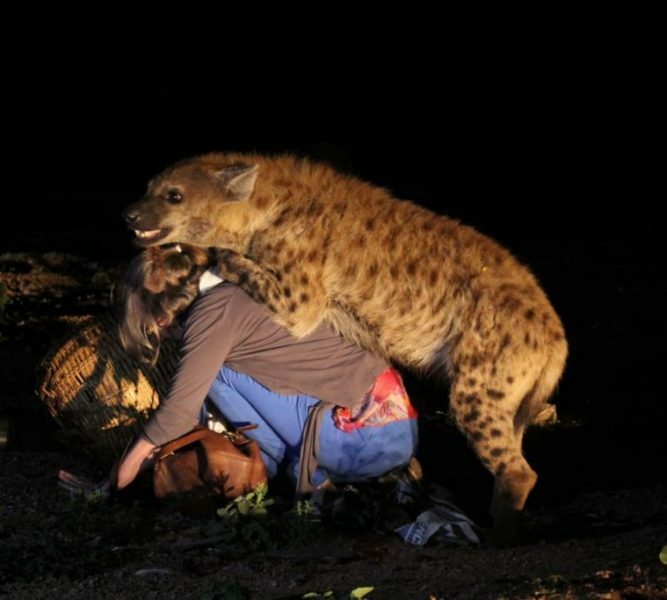 Just after the nightfall, there is perhaps the city’s most curious custom: hyena feeding. 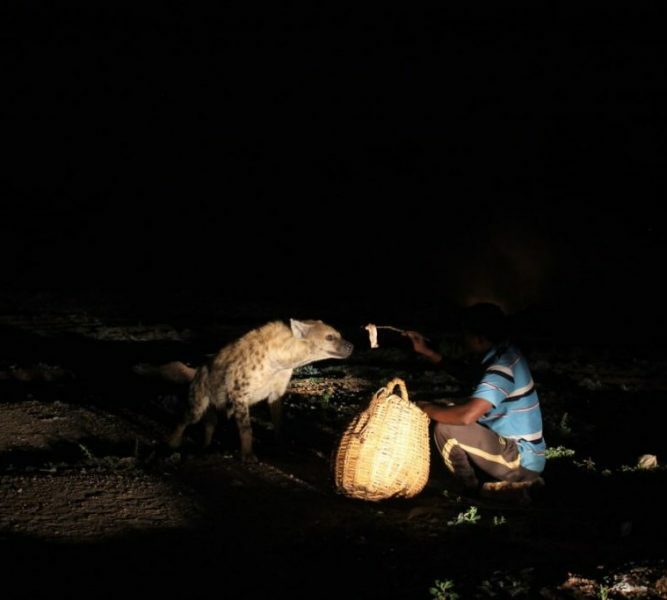 One lone man, the sixth generation of a Harari family to do this, sits beside two large baskets of meat scraps and bones as some 20 hyenas materialize from the inky night. The huge, spotted mammals circle, then, as he calls them individually, home in to be fed chunks from a stick. 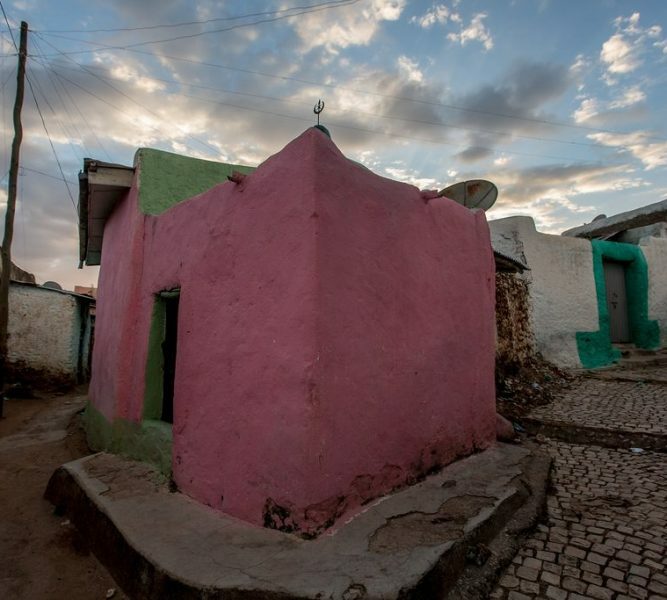 Harar’s relationship with its scavenger occupants stretches back at least 500 years. 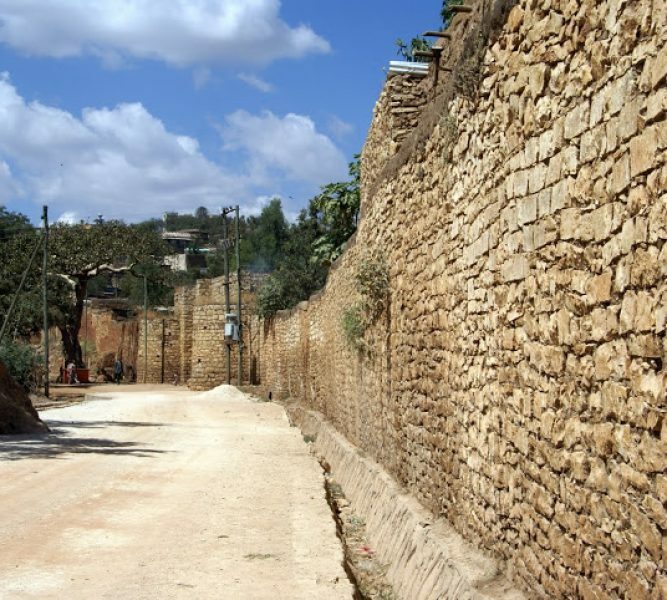 The walls of the old town have holes so hyenas can sneak in and out and it’s thought that they can see and rid townsfolk of evil spirits called “jinn” that possess them. Each year, on the Muslim holiday of Ashura, thousands gather to honor the creatures in with a local tradition seemingly at odds with the town’s holy status. 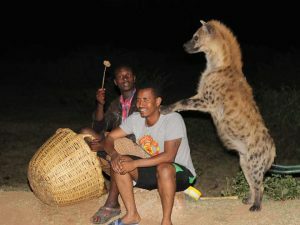 They invite the hyena pack leader to eat from the three stone bowls of buttery porridge placed outside the city’s wall. Then they measure how much was eaten to predict next year’s fortunes. If the hyena licks the bowl clean it will be a prosperous year, otherwise, tradition mandates that the town must pray to avert famine and disease. These wild animals are still come through the old town’s gates at night to scavenge among the 5,000 preserved traditional houses painted in bright pink, purple, and blue and accented with geometric designs. There are no street addresses in Harar, but it’s impossible to get completely lost—each street flows back into a familiar central square where cafes serve up spongy flatbread called injera and fava bean dip, and tailors tap away on sewing machines.